Join the annual spring-sweet search for brightly decorated character eggs. 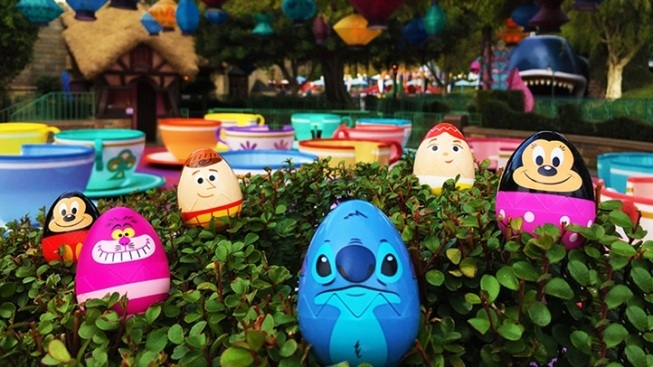 Join the annual spring-sweet search for brightly decorated character eggs through March 27. VISITORS TO DISNEYLAND RESORT... are well-practiced in the art of searching. They search for the stand selling popcorn, or churros, because they can't begin their day without their go-to treat. They search for the sign that reveals the wait time in front of a popular ride. And, of course, they always have their peepers peeled for the famous Hidden Mickeys, which can show up in the ironwork of a fence or a stone walkway or a pretty painting. But for a few weeks each late winter, and early spring, visitors to the world's best-known theme park are on the lookout for something quite seasonal: eggs. These are not the sort of dyed-in-vinegar orbs you might create at home, but rather "eggs," in quotes, that are designed in the form of Disney characters. CHARACTER EGGS: The point of the annual Egg-stravaganza is to find eggs, though not collect them -- so feel free to leave your basket in the trunk of your car -- and then to record all of the eggs you see on a special map. It's for purchase in both parks, at places like Off the Page in Disney California Adventure and Disneyana in Disneyland, and costs $5.95 (plus a bit more for tax). Once you have a map in hand, well, off you go, like Alice down the rabbit hole or Mr. Toad in his beloved motorcars. Stickers will come in handy for noting where an egg was spied, so stick away as you traipse about the parks. And once you turn that map back in, well, bibbidi bobbidi: You'll receive a "surprise." HALLOWEEN AND THE HOLIDAYS... often come to mind first for people, when they're asked to ponder what seasonal stuff Disneyland observes. But via Egg-stravaganza, Easter, too, is given its spring-sweet time at the Anaheim destination. It's also worth noting that a Disney California Adventure experience will be wrapping up on March 30, if you want to catch it one last time (or for the first time): The Mad T Party. Yep, there's a spot within the party called The Rabbit Hole, too, if you want to round out your egg-themed, bunny-season day.